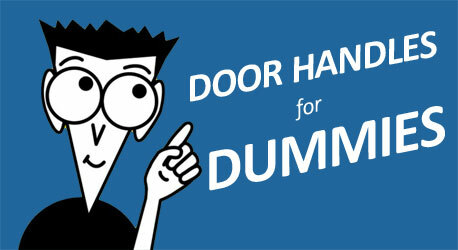 Door Handles, every home has one, here's the not so ultimate guide to door handles - Door Handles for Dummies. Excuse the pun but handles are extremely handy, in fact this is where they get their name from probably from the Viking Old Norse word hondle meaning to seize. There are many types of handles out there, fork handles, broom handles etc! but we are only talking about the type we normally see fitted to a door inside a house, hence the term Door Handle. So what are the different types of door handles? Without going into too much details (remember this is for dummies) your first decision is going to be the choice between a handle on a backplate or a handle on a rose, this decision will be one only you can make, based on personal choice and of course the style of your home and design of your doors. This more traditional type of handle has a sprung lever/handle on a rectangular backplate which is screwed to the face of the door, they are supplied in opposite pairs for both sides of the door. This type of handle comes in several variants including the latchset, lockset or bathroom set for use on different doors around the home. This is a more contemporary type of door handle which has a sprung lever/handle on a round or square fixing rose which is bolted through the door to the rose on the opposite side of the door. This type of handle has various matching accessories such as bathroom thumb turns and keyhole escutcheons for use on different doors around the home. Both handles do the same job, basically allowing you to push down a handle (or as our American friends like to call it the lever) in order to operate or retract the latch allowing you to open the door. This is your basic door handle on a backplate generally used on doors that you don't need to lock such as the living room or dining room. It consists of a handle/lever on a backplate which when pushed down turns the spindle which passes through the door and the tubular latch inside the door allowing the door to be opened. This door handle is exactly the same as a latch handle as above but it has a keyhole cut out of the backplate below the handle/lever to allow a key to be entered into the door to operate a sash lock inside the door. This handle is commonly used on a back door or a patio door or perhaps an office door. The bathroom door handle has a thumb turn sometimes referred to as a turn and release or a snib and release below the handle, this is attached to a 5mm spindle which passes through the door and a bathroom lock inside the door allowing the door to be locked and unlocked. As the name suggests this handle is commonly used on bathrooms and toilets. The door handle on rose has an outer ring on the rose which is unscrewed or pulled off to reveal several fixing holes, bolt through fixing are supplied which pass through holes in the body of the tubular latch which when tightened pull the handle rose securely against the door. For added strength and security the splined spindle which passes through the latch and into the shaft of each handle is secured from underneath with a grub screw. 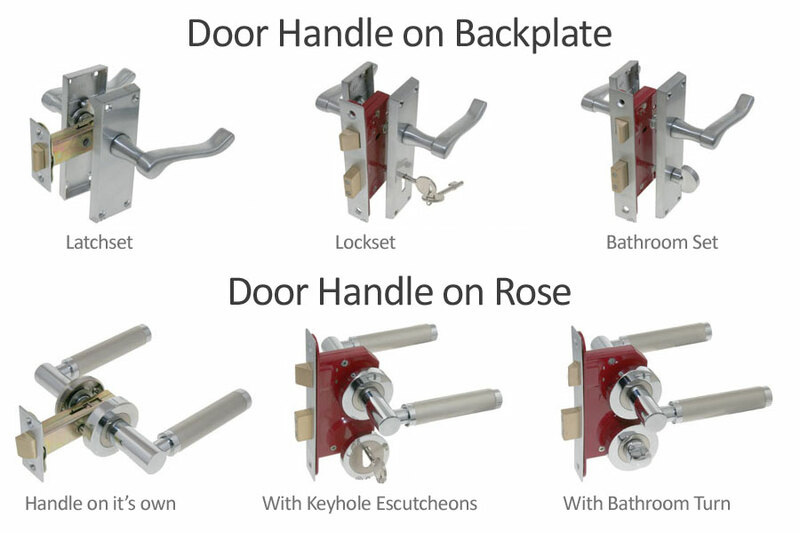 As you can see in the image above the same pair of door handles on rose can be fitted with a sash lock (sold separately) and a pair of matching keyhole escutcheons (also sold separately). The sash lock has an 8mm square hole at the top to accommodate the spindle for the handle which works the latch and a key hole below to take the key which works the lock. Finally the same pair of door handles on rose can be fitted with a bathroom lock (sold separately) and a matching thumb turn (also sold separately). The bathroom lock has an 8mm square hole at the top to accommodate the spindle for the handle which works the latch and a 5mm square hole below to accommodate the spindle for the thumb turn which works the lock. All door handles come in a variety of different finishes to suit personal tastes and the style of your home, examples of finishes include, polished chrome (shiny), satin chrome (matt), polished brass (shiny, normally laquered to stop tarnishing), black antique, pewter and bronze to name a few. Dual finishes are also very popular mixing two finishes on the one handle design. In our door handles on rose range we offer over 30 finishes or finish combinations from over 20 different brands helping you choose the right handle for you. Fitting new doors? or replacing existing handles? When buying door handles it is important to understand that the latch or lock that goes inside the door is normally sold separately. The only exception to this is if you are buying door handle packs which are normally supplied with the corresponding latch or lock and hinges. There are many reasons to replace your old door handles, maybe you just moved in and don't like the existing ones, or perhap your old door hardware is looking a bit scruffy and worn out with the handle drooping down with a broken spring! If you are fitting new door handles to existing doors with locks or latches already fitted you may consider using the existing ones, this is normally okay unless they are old imperial sized locks and latches or they are worn out from use. On a strict budget or feeling extravagant! Do you get what you pay for? Well yes and no, you can buy a pair of door handles for under £10 or you could splash out £100 for a pair of top branded Italian designer handles (or probably twice that amount if you just walked into a hardware shop in Battersea!). Choosing the right products and selecting the appropriate accessories can be a daunting task, that is why we have an experienced customer service team who are more than happy to help you every step of the way… Call us on 01206 213499 we are here to help. We would like to thank dummies for the inspiration behind this post and therefore it seems only fair to add a link to the Dummies Home & Garden category where you can find loads of great information for dummies!